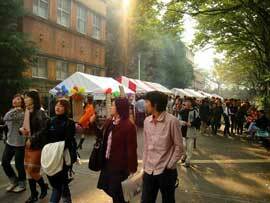 Students stroll along the campus during the school's cultural festival, which many hold on Culture Day. Photo from the Sophia Times. Culture Day on November 3rd can be traced back to a pre-war holiday that celebrated the birthday of the Meiji Emperor. In addition, the post-war Japanese Constitution was promulgated on this day in 1946. The Holiday Law defines Culture Day as symbolizing “love for liberty and peace and the advancement of culture.” In Japan, Orders of Cultural Merit are granted every year on this date to men and women who have contributed to the advancement of science, technology, and art and culture; the award ceremony is held at the Imperial Palace. The Agency of Cultural Affairs also holds the National Arts Festival around this day. Finally, since autumn is a season for cultural festivals, many schools and local governments schedule their annual cultural festival on Culture Day.